Bigger, Better, Boom! 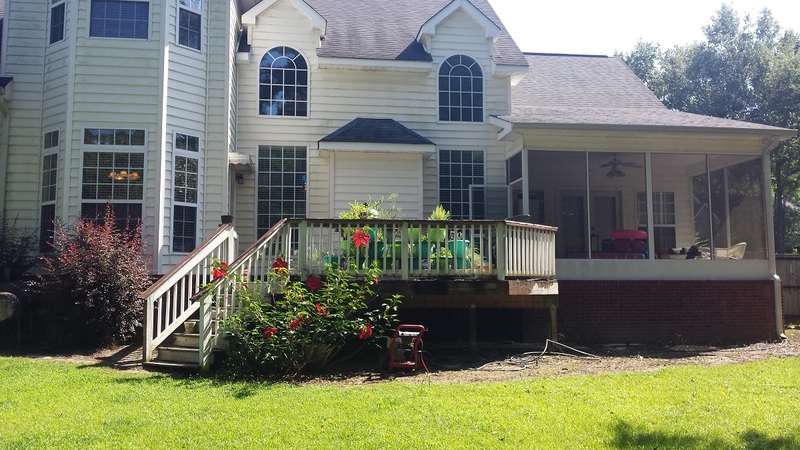 Archadeck of Central GA Expands and Updates Deck in Bonaire, GA! If you’ve got more house, we can build you more deck! That’s what you see in these photos of our recent redeck, deck extension and pergola project in Bonaire, GA. Premier deck builder Archadeck of Central Georgia aims to please, so if you want a longer deck, that’s what you will get. 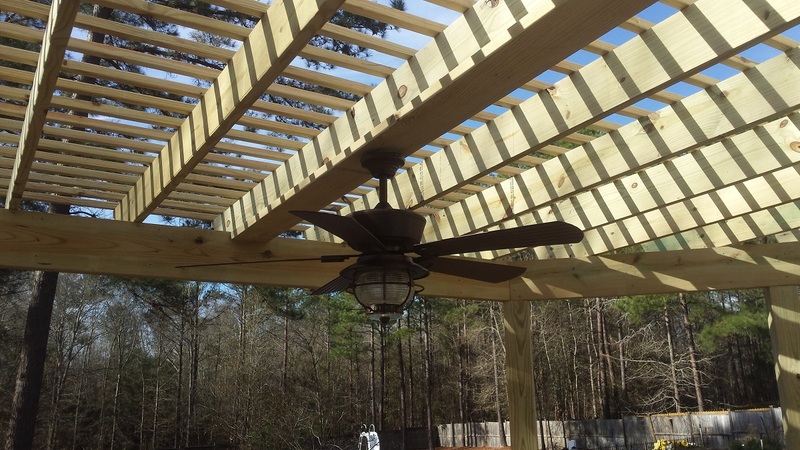 — Beautiful deck and pergola combination by Archadeck of Central GA. This home’s original deck was made of wood that had aged a good bit, so the clients definitely needed to replace that. Luckily, the substructure supporting the original deck was still in good shape. That meant we were able to redeck instead of having to replace the original deck entirely. — Deck before Archadeck of Central GA began the updating project. If you’re not familiar with redecking, it means we can replace the boards that make up the deck’s surface without having to replace the substructure. The two advantages to redecking are saving money and saving time. 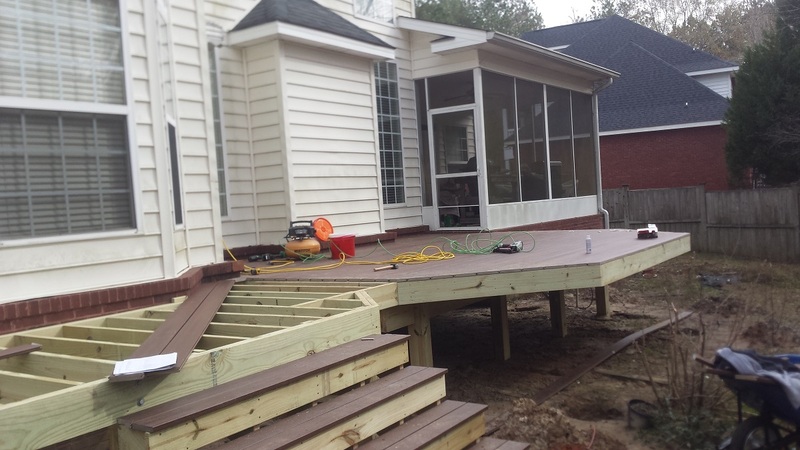 With redecking, your project can be completed that much faster! The option of redecking exists because the boards used to build the deck’s substructure don’t go through the weathering process that affects the deck’s surface, railing and stairs. The sun and rain cause horizontal boards to swell and shrink repeatedly until the wood fibers start to lose their structural integrity. This is why wood decks need to be replaced sooner than composite decks do. Meanwhile, the supporting beams and joists under the deck are in the shade and are oriented vertically shedding water. So the structure does not go through the same expansion and contraction cycles as the decking. As long as they’re capable of supporting the weight of the new deck surface, we can leave the substructure in place and use it again. That way you don’t pay for materials or labor to build a new support structure. 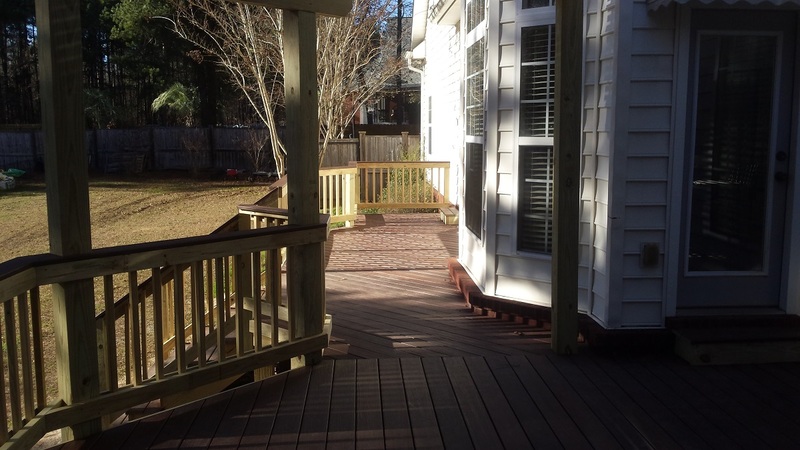 Before we can quote your job with redecking in mind, we go beneath your deck and inspect the substructure. If you’re replacing your wooden deck surface with composite decking, the substructure will have to support more weight than it had previously because composite decking weighs more than wood. 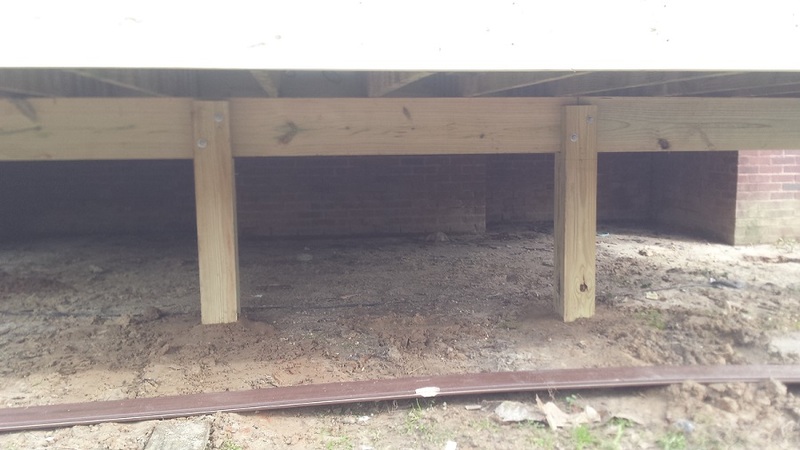 In the case of the project we’re looking at today, the substructure was sufficient to support a composite deck. As you can see, the clients had plenty of room across the back of their home for extending the length of their deck. The original bay-shaped deck was designed to fill the space that is set back between the dining room bay windows and screened porch. Why stop there? The homeowners wanted a longer deck. Extending it along the length of the living room and dining room was the perfect solution. To accommodate a longer deck, we redesigned the stairs, too. The new steps are much wider and are centered to be accessible from either side of the deck. Best of all, they update the look of the entire deck significantly. 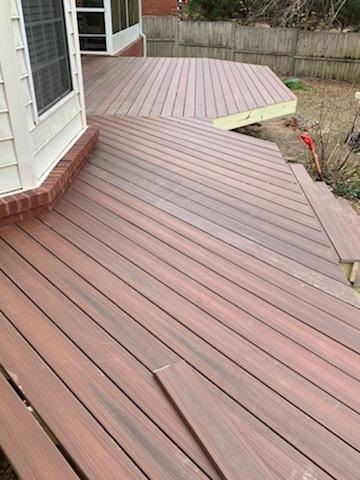 The decking material these Bonaire, GA, homeowners chose was Fiberon’s Horizon decking in the rosewood color. It’s the perfect shade to complement the home’s brickwork still visible below the screened porch. Introducing the Pergola – And It’s a Big One! 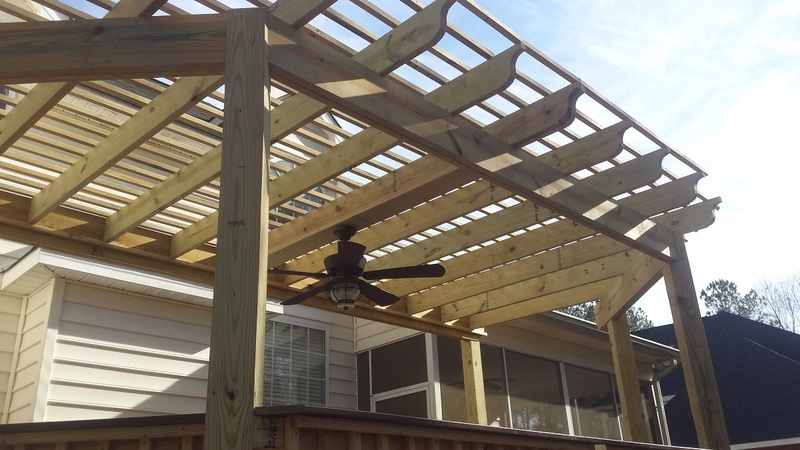 The clients wanted to add a pergola for shade over the original bay-shaped deck area. 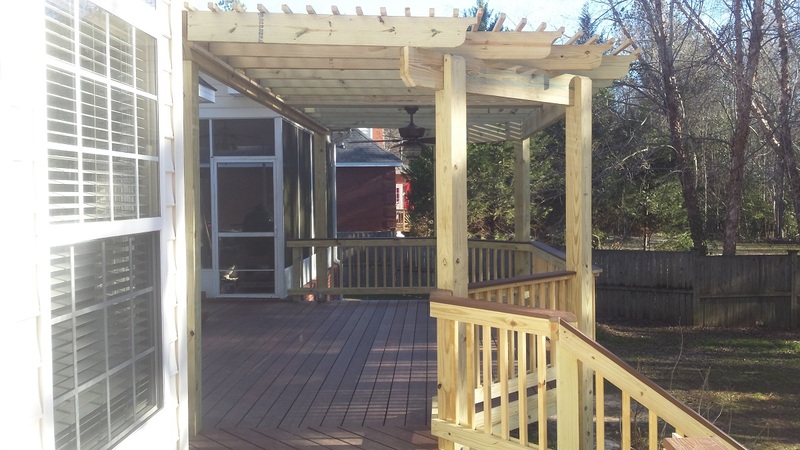 This pergola is striking, 18 feet wide with an octagonal shape. The pergola looks so natural there now, you would think it had been there all along. We built the pergola with pressure-treated wood. The S-shaped design on the end of the rafters is called an ogee cut – very popular for pergola designs. Notice that the beams of the pergola are designed with minimal traffic and view obstruction in mind. Where many builders would have just placed the beam in the middle of the pergola, Archadeck employs the use of a drafting department. Our drafting department was able to specify the best placement of the beam in order to retain the traffic flow, view and structurally integrity of the pergola addition — making it a win/win for everyone! If you’re kicking around ideas about replacing, extending or redesigning your old deck, we are the company to call. We can offer design ideas to refresh your deck and turn it from boring to brilliant. 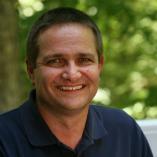 Archadeck of Central Georgia is the Macon and Warner Robins area’s premier outdoor structure builder. Give us a call today to schedule a design consultation at 478-745-2000 or via email at [email protected].